Gold is getting crushed. Again. The yellow metal is at $US1,140 per ounce, down by about 2.3%. It got as low as $US1,137. This is the lowest level since April 2010. 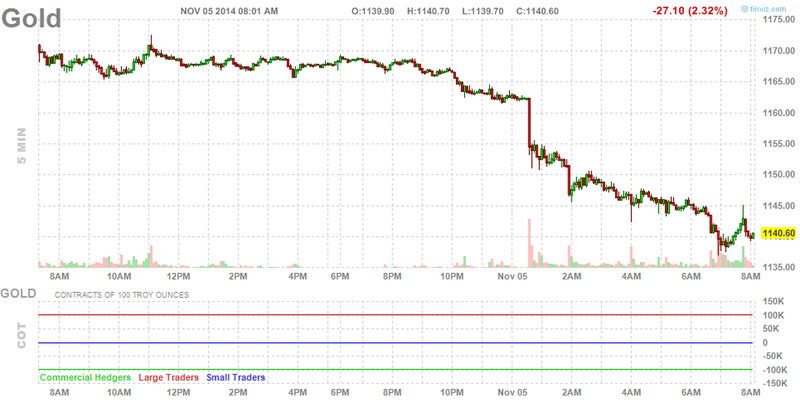 Gold has been dropping to new lows for several weeks as the dollar has strengthened. Oil is another commodity that is tumbling again. WTI crude oil prices dropped as low as $US75.84 per barrel shortly after 5 a.m. ET. Brent crude touched $US81.63. While this is great for consumers, this is troubling for the oil producers, who may be forced to idle unprofitable projects. 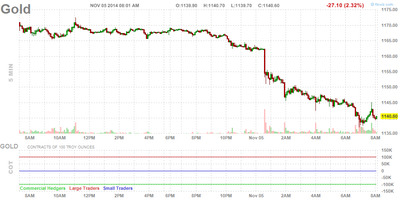 US equity futures are up, with Dow futures up 56 points and S&P futures up 7.9 points. In Europe, Britain’s FTSE is up 0.9%, France’s CAC 40 is up 1.4%, and Germany’s DAX is up 1.2%.